Sudanese troops have opened fire inside a Darfur refugee camp, leaving 27 people dead, a rebel group has said. Some 100 government trucks surrounded the Kalma camp, home to some 90,000 people who have fled their homes in Darfur, a rebel spokesman told the BBC. An army spokesman has confirmed there was an exchange of fire after a patrol was sent to investigate reports of a weapons cache in the camp. More than two million people have fled five years of conflict in Darfur. The US has said it is concerned "by indiscriminate weapons-fire by Sudanese government forces" in Kalma. "Attacks on vulnerable populations in Sudan are deplorable and violate international law," Deputy State Department spokesman Robert Wood said in a statement. Ahmed Abdel Shafie, who heads a faction of the rebel Sudan Liberation Army, told the BBC that the government wants to force people to leave the camp. Another rebel leader puts the number of those killed higher. Abdel Wahed Mohamed al-Nur, said that 50 people had been killed. "This really is a catastrophe. People are being killed while the world just watches," he said. Reports from inside the camp put the toll lower. Adam Mohamed, a community leader in Kalma, near South Darfur's capital Nyala, told the AFP news agency that eight people had been killed and 30 wounded. The international aid agency MSF which works inside Kalma said at least 65 people had been injured. It is appealing for a safe passage to evacuate the most seriously wounded. A spokesman for the joint United Nations-African Union peacekeeping mission in Darfur said they had sent patrols to check the reports and were very concerned about the situation. 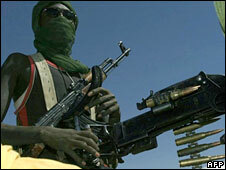 The BBC's Amber Henshaw in Sudan says Kalma has long been a centre of unrest, awash with weapons. Sudan's government has accused armed rebel supporters of taking refuge inside the camp while residents have accused government-backed militias of mounting a series of raids on the settlement. The reports came on the day that the new joint UN-African Union mediator Djibril Bassole was due to arrive in Khartoum to take up his position. Violence in Darfur began in 2003 when rebel groups complaining of discrimination against black Africans began attacking government targets. The government mobilised what it called "self-defence militias" in response, but denies any links to the Janjaweed, accused of trying to "cleanse" black Africans from Darfur. The UN estimates that more than 300,000 people have been killed and two million displaced during five years of fighting.